Initial Deposit: $49, $99 or $200 for a $200 limit. This is one of the best secured credit cards out there. The unique feature of this card is that you may only be required to put down a portion of the initial credit limit of $200 (making it a partially secured credit card). You are also eligible for a credit line increase without having to put up additional deposits after 5 months (we know of no other card that has this feature). They are also one of the rare secured cards that report as unsecured. The only thing we could nitpick is that they do not have a reward program! I got this card after a bankruptcy discharge. My score was about 470. I decided to put a $500 deposit and got a $500 credit limit. I kept my spending to no more than $50 a month (10% utilization) and pay it off every month. There was once where I maxed out but paid it back before the statement arrived. After 6 months, I got a credit increase to $800 (saw that in my statement). About 4 months after I got this card, I also applied and was approved for the Discover it secured card. I deposited $300 this time and got a $300 limit. My score has since gone up to 600 (that is over 130 points within 7 to 8 months). I applied for this card when my EX score was about 468. I deposited $200 and was given a $200 limit. The one thing I noticed and liked was that Cap One post to your credit report a couple of days after your statement date. For the most parts, I kept my utilization at about 10% and on occasions, they went up to 75% though I always paid them off. I got a $300 credit limit increase on my 6th statement. After 10 months, Cap One offered me a quicksilver card (pre-approved in the mail). I took up the offer and was approved for $1200. So it seems like if you have a good track record with them, they will offer you an unsecured card even while you have their secured card. I applied for this card after I graduated from college (where I did not have any credit card and hence did not build my credit at all). So I put down my score as 400 here (it is probably zero!). I decided to put down a $1000 deposit and got a $1000 credit line. Fast forward one year later and my score is now 700. I just applied for the Chase Freedom and was given a $10000 limit. So this card did serve it's purpose of helping you get started and build your credit. The app was really easy to use and I did not have to call CSR a single time. My wife and myself had to file for BK due to some large medical bills. When we emerged from bk, her score was TU 524 and mine was 545. We both applied for the Cap One secured and was approved. I had to deposit $99 to get the $200 deposit and she only had to deposit $49! (go figure). We knew our objective was to rebuild our credit quickly. So we only used about $30-50 on the card each month and paid it off in full every month. On our 7th statement, we found out that we were both given a $300 credit limit increase, taking our credit limit to $500 each. After 11 months, wife got a message in her app that her card has graduated to unsecured and her $49 deposit was credited against the card. I also graduated a month after her. At the end of one year, our scores were about 660. Capital One has been instrumental in helping us rebuild our credit history. I am very unhappy with my experience with cap one. After I was approved for this card and made my deposit, I got a message saying that there was fraudulent activity on my card. How can there be any fraudulent activity when I just applied, paid the deposit and not even received my card. I was asked to provide bank statements, utility bills etc. Who would do that over an email or fax. Has anyone faced this problem? I decided to deposit $400 when I got approved for the card and was given a $400 limit. My goal was to get my score up to the high 600 score area so I could apply for a mortgage. I put a couple of my bills on autopay and just charged a little to the card every month and paid if off in full. I checked my credit report after the first statement and found out that Cap One a couple of days later. My balance showed zero but despite that, my score went up 50 points the next month. It just goes to show that the accepted idea of "leaving a little balance" is simply a myth. After my 10th statement, my limit was increased to $1500. I decided to apply for the Federal Navy cash back card and was given a $7000 limit. My score is now about 710 on EX. Capital One has been wonderful to me. I have never gotten into debt and always pay cash. But since my plan is to eventually buy a house, I knew I had to build up a credit history. After lots of research, I decided to apply for this card. The main reasons are that there is no annual fee, reports as unsecured, gives credit limit increases and even graduates. I started off with a $300 limit (had to deposit $300). I made sure my utilization was low and after 6 months (on my 6th statement), I saw that my limit was now $600. 9 months later, my score had gone up from 560 to 660. I got a pre-approved mail on their quicksilver with a $500 limit and an automatic increase after 5 months. I applied and was approved. I have also recently been approved for Discover it with a $4000 limit. I applied for the Capital One secured card six months after by BK discharge. Score was about 480. I got approved to $200 limit with $99 deposit. I deposited $199 instead to get a $300 limit. One of the cool things about Cap One is their app. It is really handy because you can track all your transactions, pay your bills and track your credit score. I took the advice of many folks here and simply charge a small amount every month and pay it off in full every month. On my 8th statement, I noticed that my limit has been upped to $600. A year later, I received a notification in the app that I was being upgraded to an unsecured card and my $199 would be credited against the account. A few months later, I got another CLI to $2000. Thanks CapOne for helping me rehab my credit. And BTW - my score is now 650. When I graduated from college, I got a very good job and carried a few credit cards. Life was good but my credit card debt kept going up. Then I lost my job and everything just went out of control. I had so many collections and settled some. Most are on the way to being dropped off from my credit report. I checked my score and was relieved that it was 570 (thought it was going to be in the 400s!). Anyway, I applied for this card and Cap One approved me. I had to put up a $200 deposit for a $200 credit line. After 7 months, I got a credit increase of $300 and the limit is now $500. My scores also improved to 660 (though I suspect this was helped my more negatives dropping off from my report). My experience with the card has been good. Use the app all the time to check on the account also to pay the bill. If you are looking to rebuild, I would highly recommend Cap One. 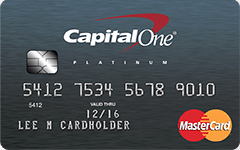 While the features of the card are great, I have had a very bad experience with Capital One. 4 days after receiving my card, I got a card from the fraud department saying there had put my card on hold. He then went on to ask me questions to "verify my identity". Then he said everything was ok and that the hold was lifted. 2 days later, I used the card at Walmart and guess what, the card was denied. Thank goodness I had cash with me. I went home and called CSR again. This time a lady answered and I was told the hold was not released due to some internal issue and she confirmed with me that the hold was definitely lifted. I have never had a problem since but this left a sour taste in my mouth. Love this card. They reported to the bureaus before my first statement was even due. Score went from 612 (EX) when I applied to 665!! I also love their credit tracker. Am addicted to it as I'm always checking my score. After 11 months with this card, I got an alert in their app congratulating me that I have been upgraded to an unsecured card and my $200 deposit was returned. So yes, it is possible to graduate directly to an unsecured card with Cap One. I just recently got upgraded to unsecured. But this took a while. I originally started off with a $300 limit having to deposit $49. On my 6th statement, I got a credit line increase to $500. After 7 months, I applied and got approved for a Walmart card for $700. I also applied for a Discover it and got approved for $1200. After a year on the card, I called Capital One to request a graduation to an unsecured card. I was denied over the phone. However, 2 months later, I got the notification on the app that I was graduated to an unsecured card and my $49 was refunded. My score is now 690. One of things that is not mentioned often here is that Capital One does a hard pull on all three bureaus. Aside from that, everything else about the card is absolutely great. I use the app and it does everything. You can see your transactions, pay your bills and check your credit score. I got approved for $200 and had to deposit $49. However, I deposited $149 and got a $300 credit limit. I put my netflex and cellphone bill on autopay and made sure I paid my bills in full every month. I tried to stay within 20% utilization ratio. When I got my 7th statement, I noticed that my limit was increased to $500. My score had also increased by 70 points and was now about 630. After a year of using the card, my score is now 690 (close to 700). I have applied for and gotten approved for a couple of unsecured cards with $3000 limits. This card has definitely helped me to improved my score. The app is great and I never had to call customer service at all. This is the best card I have had for rebuilding my credit. When I got this card, my scores were low 500. I had to deposit $49 to get a $200 limit. On my 6th billing cycle, I noticed that my credit limit has been increased to $500. I continued to use the card as I always had and on my 11th statement, I got a mail saying that I have been upgraded to an unsecured credit card. A month later, I got my Capital One quicksilver cash back credit card. If you are a rebuilder like I was, then get this card and forget about all the other offers that you get. There is no annual fee and the deposit you put up (which you will get back) is much lower than the fees you would pay on other cards. I went through a divorce and had to file for bankruptcy. When I got this card, my score was EX 506. I had to put a $99 deposit for a $200 limit. I have read that Cap One could give you a credit limit increase after the 5th statement if you were always on time. I worked diligently on making sure my utilization was below 30% and had my card set to autopay from my bank account. On my 6th statement, I saw that my limit has been increased to 600 (nearly a hundred point increase). I had quite a few collections in my report and I kept getting denied by most cards. I disputed a couple of incorrect ones and once they were resolved and fell off my report, I applied for the Cap One secured card. My score was 490 when I applied and I had to folk out a $99 deposit for a $200 credit limit. As with many folks here, I got a credit limit increase of $300 (taking the total to $500) after 7 months. I actually did not realize it until I saw my statements. You won't get any emails from them about the credit limit increase. And asking for it would not help either. I was told it is all automated. My scores did go up to 600 after slightly over a year with the card. I also got a pre-approved offer for the Quicksilver and was approved for $1000. I needed to rebuild my credit a couple of years ago and got this card. I had to pay a deposit of $49 and got $200 in credit limits. I autopay my cell phone, tv and utility bills to the card and just used it for gas. After a few months without me asking, I found out from my statement that they had increased my credit line to $1000. It has been about a year and a half now and I have just been approved for the quicksilver for $5000. Once I get another card with a decent limit, I will cancel this card. Would highly recommend it if you are rebuilding. I got this card for 2 main reasons. There first was there is no annual fee. The second reason is that I've read that Capital One will very likely increase your credit limit after 5 months of paying on time. After 6 months, I called up their rep and asked for a CLI and was told I should get it soon. Into 9 months and still no credit line increase (even though I have been paying on time). Called CSR again and was told most likely to happen by the end of 12 months. It's been over a year and I'm still stuck with my $200 limit. I started out with a $200 limit but with only a $49 deposit. I kept my utilization at 15% max and after 6 months, my limit increased to $49. I was using their app most of the time and it was pretty cool. You get to check your credit score, transactions and even pay your bill through it. After six months, my credit limit increased to $1000. Then after a year, I got an alert that the card was being upgraded to an unsecured card and my $49 deposit was "credited" back into my account. It was not deposited but rather will be used to offset the next payment. Between that period, my scores have increased over 100 points to 650. I never thought that I would be approved for this card. My score was below 500 and I was approved. I had to deposit $200 and got a $200 credit limit. I got my card in the mail about a week later. I put my netflix bill on autopay and simply put a few gas bills on the card. I made my payments in full and on time for 5 billing statements. On the 6th statement, I saw that my limit had been increased to $500. My credit score has also improved by about 100 points and is now at 596. I have to give this card a 5 star. I applied when my score was in the low 500. I had to deposit $200 and was given a $200 credit line. After using the card for 7 months, I had my limit increased to $1200. I put my hulu and cell phone bills on the card for autopay. I think as long as your utilization is low, Cap One will look at this very favorably. I use the app a lot and it is very user friendly. I can pay bills from the app and also track your credit score. When I got this card, my score was nothing to be proud of. They were hovering around 500 area give and take. I was approved and had to deposit $99 to get a $200 limit. I put a couple of stuff like my cell phone bill and netflix bill on autopay. I also made sure my utilization was 30% or below. After 9 months of paying in full and on time, Cap One sent me a mail with an offer for the "platinum" card. Said I was pre-approved. I applied and was approved for $500 in credit limit. Unlike some folks here who got a credit line increase, I simply got an offer for another Cap One card. I never had to call customer service. The app basically takes care of everything. After about a year, my score is now in the 630 area. I got this card to rebuild my credit. What attracted me to this card was the fact that there is no annual fee. I was approved and had to deposit $99 to get a $200 deposit. My score was about 520 then. Fast forward 11 months and I got a CLI of $300. My total line is now $500. It is not a large increase but my score has increased to 650. This should be enough to get me a couple of no annual fee unsecured credit cards. I put down a $500 deposit and got a $1000 credit limit. Approval was easy and card arrived within a few days. After using for 6 months, I got a pre-approve mail from Cap One for their QuickSilver. I applied and was approved. This is the first unsecured credit card I have had in 3 years. My credit score also went from 570 to 680. The app is also great. You can check your balance, pay with it and check your credit score. In fact, it is so good that I have not called customer service at all.